What solar technology would be the easiest and the least expensive to install? Passive solar would likely be the easiest and least expensive option. The methods involved in passive solar are described well in References 1 to 4. The Solar Barn in the Reference 5 example provides details on installing a passive solar system with typical costs. Obviously upgrading a home would cost more. One could possibly incorporate a solar room (or greenhouse) as a simple add-on before opening up the house to the solar room. By comparison, Reference 6 cites the typical cost of installing a solar water heater at about $4000 to $8000. Reference 7 does provide a lower estimate. A neighbor has installed a solar water heater system and during initial operation of the system had a number of problems properly controlling pressure in the system. The Department of Energy provides webpages that allow you to figure the gain due to using solar (Reference 8). Reference 9 is a help page for using this not-necessarily intuitive tool. PVC (Reference 10) and Concentrating Solar (Reference 11) maps are also provided. What are some of the challenges of generating electricity with solar technology, especially on a large scale? The major hindrance to widespread use of solar energy is the cost of the photovoltaic cells or concentrating solar plants. Table 1 from Reference 12 provides a cost comparison, as well as highlighting other challenges, namely variability of the resource and transmission access. References 13 and 14 are additional helpful references found during the research on the topics. The major hindrance to widespread use of solar energy is the cost of the photovoltaic cells or concentrating solar plants. 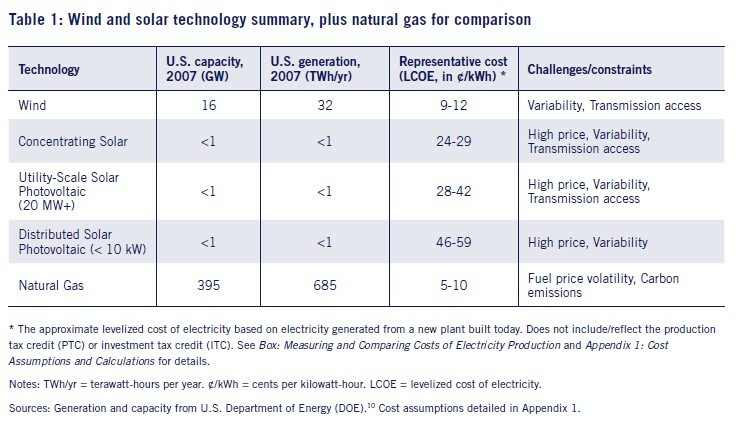 Table 1 from Reference 12 (see above) provides a cost comparison, as well as highlighting other challenges, namely variability of the resource and transmission access. Storage capability and space needed are also valid issues. Storage methods suited to the diurnal cycle of solar energy need to be improved. The Pacific Northwest, while having about 1/3 of the solar intensity impacting the earth compared to Arizona (Reference 8), does have several large unoccupied land locations available, namely the Hanford (References 15, 16) and Idaho (References 17, 18) Department of Energy sites. The question is - would the federal government release the land for such a purpose? Likely additional spots would be available elsewhere in eastern Washington and Oregon and southern Idaho where large expanses of flat land, qualifying as poor farm land or range, exist. Another item to consider is the impact on wildlife habitat (References 19-22). The Arizona Fish and Game department article also identified large impervious surface areas and use of large amounts of water (Reference 19) as potential impacts to consider. The California desert habitat concern noted in Reference 22 is likely to be the first of many similar impacts that will be brought up when solar plants come to fruition. Another challenge is the need to improve the efficiency of the solar cells. Efficiency is still low at less than 10% (References 23-26). Every area of the United States has a unique energy generation profile that is optimum for the area. For the Pacific Northwest, hydro, wind, and wave generation methods appear to be best suited for the area. However, solar still has a place. More area would needed to accommodate the less than optimum sunlight.